As a newborn photographer, you’re responsible for capturing some of the earliest moments of your subject’s life. Not only are you being trusted with your client’s baby, but it’s up to you to ensure that his or her earliest photos turn out beautifully. Although natural light is ideal for many styles of photography, we can’t control the weather or even always decide our working hours. This is where a softbox will come in handy. A softbox is a must-have for newborn photography, and one surefire way to take care of all of the concerns listed above. This extra implement will make your lights easier to use, give your images more clarity, and not to mention keep your newborn subject safe from the flash. Softboxes are easy to use and fun to experiment with. What’s the difference between a softbox and an umbrella? Should you use one, the other, or both? Umbrellas are more portable, less expensive, and typically faster to set up, but softboxes give you more control over light direction. If you’re very new to photography, you could start with an umbrella and work your way up to a softbox. While umbrellas are helpful, they spill light more and won’t give you as much contrast as a softbox. What you end up using primarily is more a matter of personal preference, but a good photographer should eventually have both a softbox and an umbrella on hand to use for varying needs. This gives you more versatility. Today, we will cover five of the best softboxes on the market for photographing newborns. The goal here is a soft light that will be safe (instead of too bright or startling) for your subject and look great, along with a good amount of contrast. With a quality softbox, you shouldn’t need to do as much editing as you might normally do without one. This lighting kit is easy to get set up and just as easy to pack away when you’re done. If you need to travel to do a shoot last minute, or just tend to do on-location shoots, this is a great quality. The ESDDI Softbox Lighting Kit has a wide height range and a minimum setting, which can be hard to find in other lighting kits. This ESDDI kit comes with professional, long-lasting trichromatic lamps, meant to look like the sun’s natural light. You can get beautiful shots even on a cloudy day or during the dark season. It also has an adjustable lamp holder. This softbox lighting kit is full-featured, durable, and works for both scene shooting and work in the studio. It comes with all you’ll need for video production, as well. The ESDDI Softbox kit comes with four solid, well-made light stands and will improve your equipment repertoire overall. 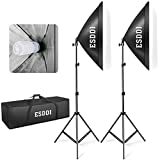 Check the price of the ESDDI Softbox Lighting Kit on Amazon. This softbox works with Shoe Mount Flash Units and produces even lighting with softer shadows and reduced harshness. The Altura Photo 2 Flash Softbox is collapsible, fits Nikon, Yongnuo, and Canon Speedlights (plus others) and comes with a storage pouch. It comes with a Velcro strap that easily secures around your flash head and also has an additional internal diffuser. Even when you use it on the lowest power output, this softbox creates soft, beautiful light. This makes it great for not only newborn photography but also wedding reception photos and other needs. The Velcro helps it attach snuggly to your flash head. Check the price of the Altura Photo 2 Flash Softbox on Amazon. If you need a continuous photo lighting kit, the StudioFX H9004SB2 Softbox could give you what you need. This three-piece system has an overhead hair light boom softbox and two softboxes and includes all the bulbs needed. Each softbox fits four bulbs and the system is good for video, product shots, and of course, newborn portraits. You can use this system on its own without any extra implements necessary. Check the price of the StudioFX H9004SB2 Softbox on Amazon. 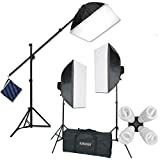 This lighting kit is quick to set up and easy to use, and the lights included work well with DSLR cameras and all types of photography. It comes with background support stands and can be used both in your studio and on-location away from the studio. But keep in mind that it may not be as portable as some other softbox systems since there are four bulbs on each unit. Use this affordable system with any camera as it’s compatible with Olympus, Sony, Canon, and more. It comes with a case for easier transport and a useful boom stand. This lighting kit is perfect for newborn photography lighting, still photography, video studio, portraits, and more. The EMART Softbox Photography Kit is easy to set up and put together. Although it has an affordable price, the materials are good quality. The light stands are durable and made with nuts and bolts, so you can expect them to hold up for quite some time. The diffusers in the EMART Softbox kit are both easy to put on and remove from the softboxes and soften the lighting well. In this kit, you’ll get a carry bag, two studio light bulbs, two light stands, and two softbox reflectors that measure 24 by 24 inches. 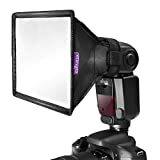 The light stands have a range of 33 to 86 inches and give steady support to the softboxes. 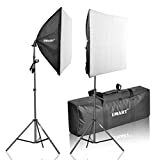 Check the price of the EMART Softbox Photography Kit on Amazon. Including another suitable softbox, this kit has been upgraded from the previous version. While the older version required you to take the light bulbs out to close it, this one allows you to fold it up without doing so. If being able to pack up quickly after a photo session is a high priority in your work, this could be a good option. The CRAPHY Upgraded Lighting Kit system doesn’t need tools or anything extra to work as it’s already complete. Included in this kit are fluorescent floodlights, for white, cool lighting. They work with any holder that has an E27 socket and are 5500k. The kit also comes with a softbox bulb holder to remove shadows, soften the light, and produce the perfect image. The bulb holder will also help to reduce hot spots and overexposure. The included light stands are compatible with most photography equipment like backgrounds, softboxes, reflector umbrellas, and more. This kit is also very portable, which is handy if you have to travel for work. You may place all of the included items in the bag, easily set them up, and then pack them again when you’re done. The CRAPHY Photography lighting kit has an auto pop-up softbox that allows you to use a small handle for putting up or folding it. The softbox itself removes shadow and creates an ultimate, soft stream of light that won’t be too harsh for newborns’ eyes. It has a silver internal face that maximizes the spread of light and minimizes light loss, creating a beautiful end result. 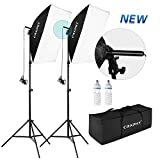 Check the price of the CRAPHY Lighting Kit on Amazon. Overall, a softbox will define your tiny, newborn subject and provide a softer, safer light for the baby’s eyes. This will help you create a much better end product for your clients.